Chrome Lower Deflectors improve the performance of your windshield by preventing unwanted turbulence around your waist and unwanted updrafts on your back. Chrome Lowers can be used together with a SwitchBlade®, Heavy Duty™ or Dakota 4.5™ windshield and a National Cycle Spotlight Bar for an integrated front end appearance. 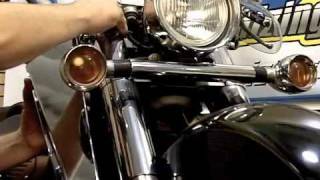 SwitchBlade® or Heavy Duty™ Windshield Mount Kit required for fitment. 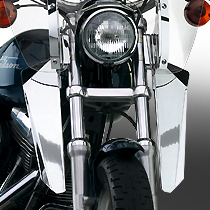 Our Chrome Lower Deflectors are available in many different sizes and styles and are specific to either SwitchBlade® and Spartan® Quick Release Windshields or to Heavy Duty™ Windshields for each particular make and model bike. Use the SHOP main menu option to select your specific year and make and model to see the Chrome Lower Deflector applications and fitments for your bike. Chrome Lowers can be used together with any of our SwitchBlade®, Heavy Duty™ or Dakota 4.5™ windshields and a National Cycle Spotlight Bar for an integrated front end appearance. We engineer our Chrome Lowers with our other accessories for proper clearance and performance. We consider Chrome Lowers a key component to your front end look and guarantee the fit of the product with our SwitchBlade, Heavy Duty and Dakota Windshields, and with our Light Bars. 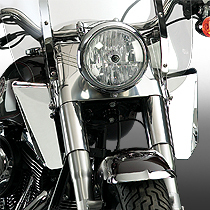 Superb polishing and chrome plating make National Cycle Chrome Lowers really stand out. 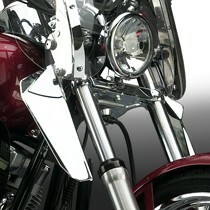 Chrome Lowers are application-specific to ensure the correct fit for your bike. 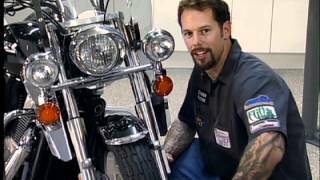 Click the SHOP menu for fitment information for your motorcycle. Our Lowers are manufactured from quality Chrome Plated Steel. They use the existing mount points on SwitchBlade® or Heavy Duty™ Windshield Mount Kits (required).